RIO DE JANEIRO (AP) Brazilian fans hugged, teared up and hung their heads Friday after their national team was knocked out of the World Cup by Belgium. 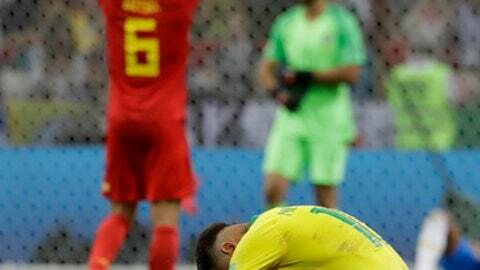 The stinging 2-1 defeat came just as the Selecao, as the team is known, had begun to gather steam, and Brazilians dared to hope that a victory could wash away years of recession, political uncertainty – and a humiliating defeat to Germany four years ago. The Brazilian team got off to a slow start this year, and its star Neymar particularly came in for criticism for not meeting expectations. But as strong teams were unexpectedly eliminated – among them Germany, Spain and Argentina – confidence began to rise in Brazil that the Selecao might actually be able to win the title and purge the memories of its 7-1 semifinal loss to Germany at the last World Cup. There was a feeling that finally the tide was turning – not just on the field, but also in the country’s overall fortunes.